Is it possible to avoid sugery in indeterminate thyroid nodule? Afirma! The Afirma method is applied in the differential diagnosis of indeterminate nodules (Thy 3a, Thy3f, Bethesda III (AUS/FLUS), Bethesda IV) to identify benign nodules and to avoid unnecessary diagnostic surgery. The first method of Afirma was Afirma – Gene Expression Classifier (GEC), a method with high sensitivity, which allowed to reclassify as less than half of the undetermined thyroid nodules as benign. Recent technological advances have allowed us to take another step forward with the development of Afirma – Genomic Sequencing Classifier (GSC) that allows us to reclassify as benign well over half of the undetermined thyroid nodules (Figure 1, Figure 2). Afirma GSC represents an advanced method available for the genomic analysis of indeterminate thyroid nodules (Thy 3a, Thy3f, Bethesda III (AUS/FLUS), Bethesda IV). Afirma GSC combines the classic RNA sequencing with GEC microarray, with the RNA sequencing that allows to extract as much genomic information as possible from the thyroid aspirate sample and to identify genomic information previously not detectable with other methods. Afirma GSC, in fact, is the only test currently available in the diagnosis of the thyroid nodule that combines the sequencing of new generation of RNA and analytical methods capable of detecting even small genomic alterations not detectable by traditional methods (such as DNA-based sequencing). Afirma GSC analyzes the RNA expression profiles of more than 1,000 genes. Therefore, with Afirma GSC, in addition to gene expression, the presence of DNA variants, fusions, copy number variants and other potentially predictive information of thyroid cancer is also evaluated. Currently, by performing the Afirma GSC analysis, the following mutations are always analyzed: RET/PTC1, RET/PTC3, BRAFV600E (for papillary carcinoma), MTC (for medullary carcinoma) (Figure 3). This powerful combination of genomic evaluations is able to further increase the ability to distinguish between benign and malignant nodules. See available packages. With GSC, the already powerful genomic testing tools available in Afirma, a new classifier was added (and validated): BRAF V600E. Using advanced generation sequencing technologies, it is possible to find BRAF V600E mutations that are not detectable by other previous techniques (such as PCR). It is known that the presence of the BRAF V600E mutation in the thyroid nodules confers the certainty of being in front of a tumor. Furthermore, since BRAF positive tumors tend to be more aggressive, determining the presence (or not) of BRAF may influence therapeutic options for the patient (eg a larger surgery rather than a lobectomy). Finally, the BRAF classifier of Afirma GSC generates few false positives. 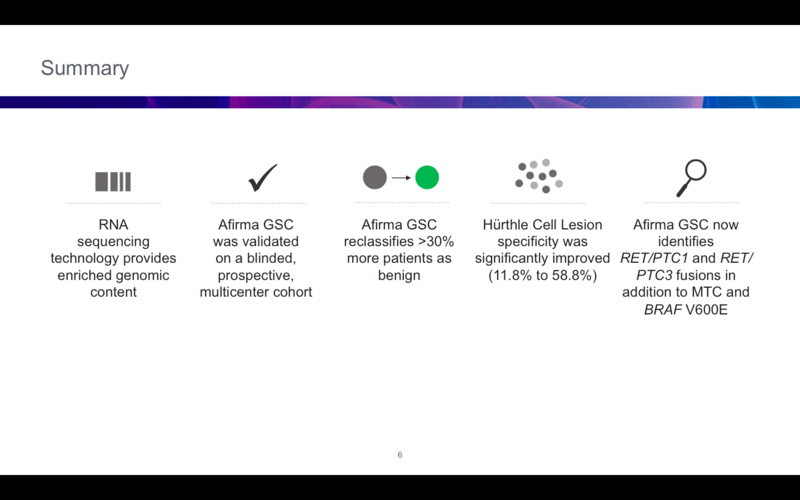 The Afirma GSC method also employs a classifier for medullary carcinoma (MTC classifier), which allows a more correct therapeutic approach for patients with MTC. The Afirma GSC method also uses a classifier for Hürthle cells (Hürthle classifier). To improve Hürthle cell classification, Afirma GSC first determines whether the FNA sample contains Hürthle cells by analyzing more than 1400 genes. If successful, a second classifier examines additional criteria, including the loss of heterozygosity, specific to Hürthle cell neoplasms, to distinguish adenomas from Hürthle cell carcinomas. This second classifier uses over 2000 genes and nearly 190000 genomic variants. In this way Afirma GSC is able to differentiate Hürthle cell tumors from non-tumors. Finally, the latter, like any other undetermined sample, are then reevaluated by the global classifier to determine their benignity. This has meant that the Hürthle cell nodules that were previously considered suspect by GEC, with Afirma GSC will be classified as benign with a higher degree of precision (with a specificity that increases from 12% to 59%) (Figure 4), further increasing the number of patients with benign nodules able to avoid unnecessary surgical operations. The parathyroids are located near the thyroid, and if enlarged, can sometimes be mistaken for thyroid nodules. Such enlarged formations (adenomas) if subjected to needle aspiration, could result, as indeterminate formations (THY3) as the cells that constitute them can often be exchanged with thyroid cells with atypical characteristics. Afirma GSC also provides a parathyroid classifier (Parathyroid Classifier) that allows to correctly identify these formations and avoid unnecessary surgeries. 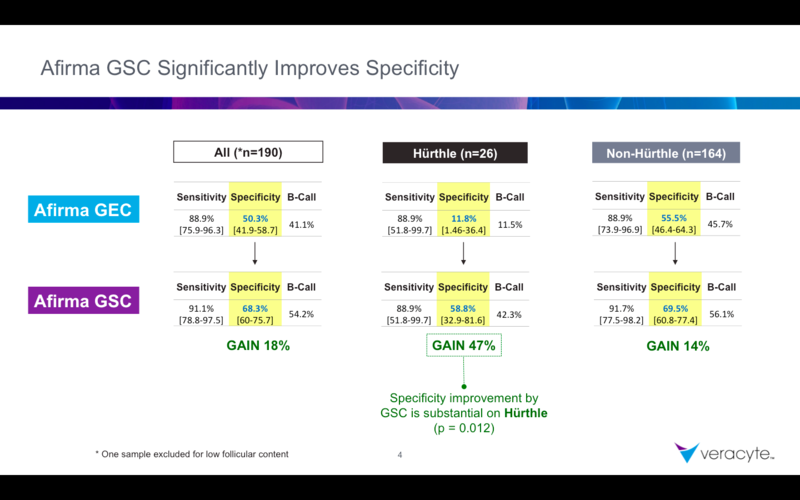 The comparison with GEC shows that the new method Afirma GSC not only maintains a high sensitivity (91%) but clearly improves its specificity (from 52 to 68%). This means that this latest generation test is able to correctly identify as benign about 30% more nodules than Afirma GEC, with a negative predictive value of up to 96% (Figure 3). These data confirm that Afirma GSC, even more than Afirma GEC, can help avoid diagnostic surgery. The other existing genetic methods, on the other hand, only evaluate specific mutations, and only analyze a few genes or microRNAs and therefore have limited clinical utility as some of these mutations are only rarely present in indeterminate tumor nodules (Thy3). With Afirma GSC, on the other hand, RNA sequencing interrogates the entire genome and uses very large and complex genetic information with methods previously never used in health diagnostics. 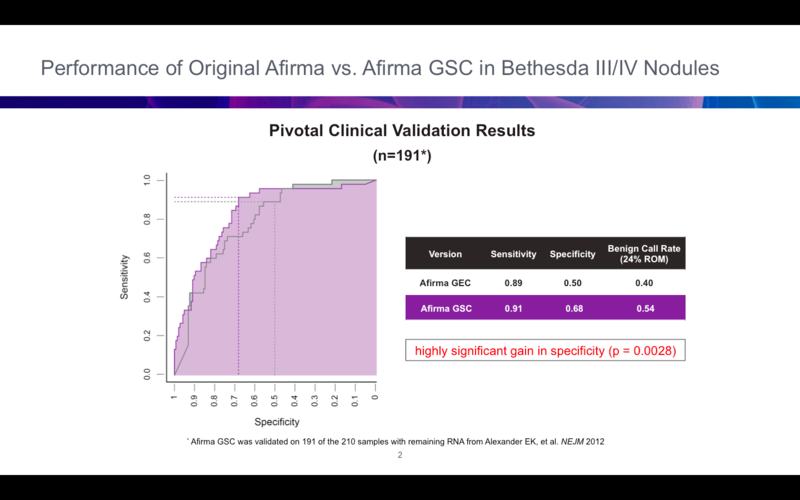 Afirma GSC is highly reproducible, but above all it has a very high analytical sensitivity with a limit of detection of 5%. This means that even if the sample taken from a malignant nodule was “diluted” or “contaminated” up to 95% from the normal adjacent tissue or benign nodular tissue, Afirma GSC is still able to classify it as malignant. This minimizes false negatives, even in the case of erroneous sampling that has accidentally affected the adjacent normal thyroid tissue. Finally, the performance of Afirma GSC is poorly influenced by the classical interferents commonly found in the samples of needle aspiration (such as blood and genomic DNA). In conclusion, Afirma GSC and its further implementaion (Afirma GSC X Atlas) represent the most advanced method currently available worldwide for the genomic analysis of indeterminate thyroid nodules (Thy 3a, Thy3f, Bethesda III (AUS/FLUS), Bethesda IV). Afirma, provides two possible results on indeterminate thyroid nodules: benign or suspicious for malignant. Afirma GSC, by reclassifying cytologically indeterminate thyroid nodules as benign, avoids unnecessary thyroid surgery and is useful in management of cytologically indeterminate thyroid nodules. Afirma was developed in the United States and, from the first studies, now it is widespread to other countries. The EndocrinologiaOggi Center in Rome (Italy), is the first center in Europe where Afirma is clinically and routinately used for stratification of indeterminate thyroid nodules. European patients that prefer a closer place to perform Afirma instead of San Francisco (United States), can do it in Rome (Italy) at a lower price (2400 €). For more information about Afirma GEC, click here. For more information about Afirma GSC X Atlas, click here. – book on line (click here). Alexander EK, Kennedy GC, Baloch ZW et al. Preoperative Diagnosis of Benign Thyroid Nodules with Indeterminate Cytology. N Engl J Med. 2012;367:705-715. Chudova D, Wilde JI, Wang ET, et al. Molecular Classification of Thyroid Nodules Using High-Dimensionality Genomic Data. J Clin Endocrinol Metab 2010;95:5296-5304. Walsh S, Wilde JI, Tom E, et al. Analytical performance verification of a molecular diagnostic for cytology-indeterminate thyroid nodules. J Clin Endocrinol Metab 2012;97:2297-2306. Alexander EK, Schorr, M, Klopper J et al. Multi-center clinical experience with the Afirma Gene Expression Classifier. J Clin Endocrinol Metab. 2014;99(1):119-25. Duick DS, Klopper JP, Diggans JC, et al. The Impact of Benign Gene Expression Classifier Test Results on the Endocrinologist-Patient Decision to Operate on Patients with Thyroid Nodules with Indeterminate FNA Cytopathology, Thyroid. 2012;22(10):996-1001. Lastra RR, et al. Implications of a suspicious Afirma test result in thyroid fine-needle aspiration cytology: an institutional experience. Cancer Cytopathol. 2014;122(10):737-44. McIver B, et al. An independent study of a gene expression classifier (Afirma) in the evaluation of cytologically indeterminate thyroid nodules. J Clin Endocrinol Metab. 2014;99(11):4069-77. Harrell RM, Bimston DN. Surgical utility of Afirma: effects of high cancer prevalence and oncocytic cell types in patients with indeterminate thyroid cytology. Endocr Pract. 2014;20(4)364-9. Sullivan PS, et al. The impact of atypia/follicular lesion of undetermined significance and repeat fine-needle aspiration: 5 years before and after implementation of the Bethesda System. Cancer Cytopathol 2014;122(12):866-72. Marti JL, et al. Wide inter-institutional variation in performance of a molecular classifier for indeterminate thyroid nodules. Ann Surg Oncol 2015;22(12):3996-4001. Brauner E, et al. Performance of the Afirma gene expression classifier in Hurthle Cell thyroid nodules differs from other indeterminate thyroid nodules. Thyroid. 2015;(7):789-96. Angell TE, et al. Afirma benign thyroid nodules show similar growth to cytologically benign nodules during follow-up. J Clin Endocrinol Metab. 2015;100(11):E1477-83. Witt RL. Outcome of thyroid gene expression classifier testing in clinical practice. Laryngoscope. 2016 Feb;126(2):524:7. Celik B, et al. Afirma GEC and Thyroid Lesions: An Institutional Experience. Diagn Cytopathol 2015 Dec;43(12):966-70. Yang SE, et al. Has Afirma Gene Expression Classifier Test Refined the Indeterminate Thyroid Category in Cytology? Cancer Cytopathol. 2016 Feb;124(2):100-9. Zhu QL, et al. Relationship between sonographic characteristics and Afirma Gene Expression Classifier results in thyroid nodules with indeterminate fine-needle aspiration cytology. Am J Roentgenol 2015, October; 205(4):861-5. Wu JX, et al. Effect of malignancy rates of cost-effectiveness of routine gene expression classifier testing for indeterminate thyroid nodules. Surgery. 2016 Jan;159(1):118-29. Ward LS, Kloos RT. Molecular markers in the diagnosis of thyroid nodules. Arq Bras Endocrinol Metabol. 2013 Mar;57(2):89-97. Ali SZ, Fish SA, Lanman R, Randolph GW, Sosa JA. 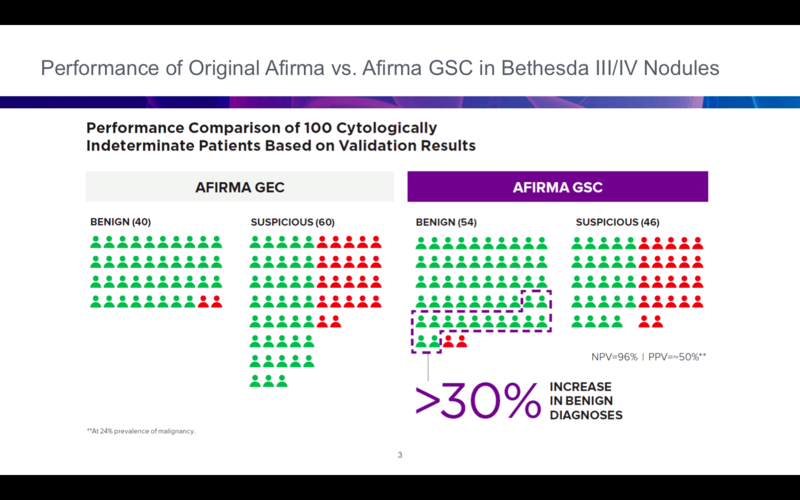 Use of the Afirma® Gene Expression Classifier for Preoperative Identification of Benign Thyroid Nodules with Indeterminate Fine Needle Aspiration Cytopathology. PLOS Currents Evidence on Genomic Tests. 2013;5:1-7. Mingzhao X, Haugen BR, Schlumberger M. Progress in molecular-based management of differentiated thyroid cancer. The Lancet 2013;381(9871)1058-69. Kim M, Alexander A. Diagnostic Use Of Molecular Markers In the Evaluation of Thyroid Nodules. Endocrine Practice 2012;18:796-802. Melillo R, Santoro, M. Molecular Biomarkers in Thyroid FNA Samples. J Clin Endocrinol Metab. 2012; 97(12):43704737. Duick D. Overview of Molecular Biomarkers for Enhancing The Management of Cytologically Indeterminate Thyroid Nodules and Thyroid Cancer. Endocrine Practice 2012;18:611-615. Li H, Robinson KA, Anton B, Sadhanha IJ, Ladenson PW. Cost-Effectiveness of a Novel Molecular Test for Cytologically Indeterminate Thyroid Nodules. J Clin Endocrinol Metab 2011;96(11):E1719-E1726. Mitchell I, Livingston EH, Change AY, et al. Trends in thyroid cancer demographics and surgical therapy in the U.S. Surgery 2007;142:823-828. Shrime MG, Goldstein DP, Seaberg RM, et al. Cost effective management of low-risk papillary thyroid carcinoma. Arch Otolaryngol Head Neck Surg 2007;133:1245-1253. Esnaola NF, Cantor SB, Sherman SI, Lee JE, Evans DB. Optimal treatment strategy in patients with papillary thyroid cancer: a decision analysis. Surgery 2001;130:921-930. Cibas ES, Baloch ZW, Fellegara G, et al. A Prospective Assessment Defining the Limitations of Thyroid Nodule Pathologic Evaluation. Ann Intern Med. 2013;159:325-332. Bongiovanni M, Spitale A, Faquin WC, Mazzucchelli L, Baloch ZW. The Bethesda System for Reporting Thyroid Cytopathology: A Meta-Analysis. Acta Cytol. 2012;56(4):333-339. Wang C, Friedman L, Kennedy GC, et al. A Large Multicenter Correlation Study of Thyroid Nodule Cytopathology and Histopathology. Thyroid 2011;21(3):243-251. VanderLaan PA, Marqusee E, Krane JF. Clinical outcome for atypia of undetermined significance in thyroid fine-needle aspirations: should repeated fna be the preferred initial approach? Am J Clin Pathol. 2011 May;135(5):770-775. Lewis CM, Chang K-P, Pitman M, Faquin WC, Randolph GW. Thyroid Fine-Needle Aspiration Biopsy: Variability in Reporting. Thyroid 2009;19(7):717-723. Cibas ES, Syed AZ. NCI Thyroid FNA State of the Science Conference. The Bethesda System For Reporting Thyroid Cytopathology. Am J Clin Pathol. 2009;132:658–665. Baloch ZW, Cibas ES, Clark DP, et al. The National Cancer Institute Thyroid fine needle aspiration state of thescience conference: a summation. CytoJournal. 2008;5:6:425–437. Berner A, Sigstad E, Pradhan M, Grøholt KK, Davidson B. Fine-needle aspiration cytology of the thyroid gland: comparative analysis of experience at three hospitals. DiagnCytopathol 2006;34:97–100. Yeh MW, Demircan O, Ituarte P, Clark OH. False-negative fine-needle aspiration cytology results delay treatment and adversely affect outcome in patients with thyroid carcinoma. Thyroid 2004;14:207–215. Renshaw A. An estimate of risk of malignancy for a benign diagnosis in thyroid fine-needle aspirates. Cancer Cytopathol. 2010;118(4):190-195. Elsheikh TM, Asa SL, Chan JK , et al. Interobserver and intraobserver variation among experts in the diagnosis of thyroid follicular lesions with borderline nuclear features of papillary carcinoma. Am J Clinical Pathol 2008;130(5):736–744. Lloyd RV, Erickson LA, Casey MB, et al. Observer variation in the diagnosis of follicular variant of papillary thyroid carcinoma. Am J Surg Pathol 2004;28:1336–1340.Hirokawa M, Carney JA, Goellner J R, et al. Observer variation of encapsulated follicular lesions of the thyroid gland. Am J Surg Pathol 2002;26:1508–1514.